Before proceeding with the step-by-step written version of this tutorial, you can start with the basic video lesson located below. 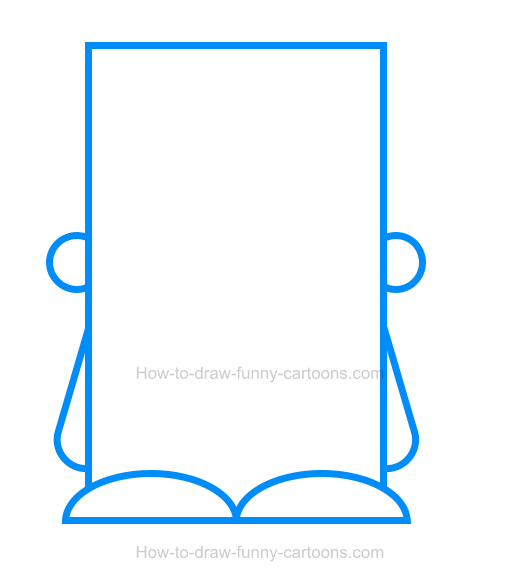 This simple exercise is a good start to get familiar with this cartoon character. 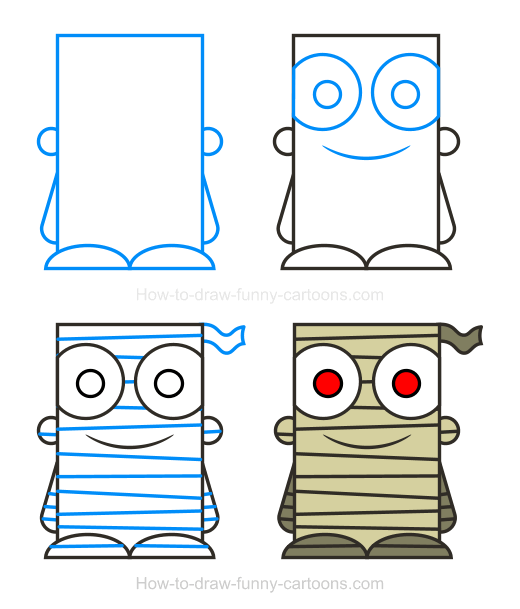 First, we can start by sketching the body of the mummy using a large rectangle. Then, you can add both ears using small circular shapes. The arms and hands are made from rectangles with round corners. The feet are created with long curved lines. Notice how all shapes are made from thick outlines. 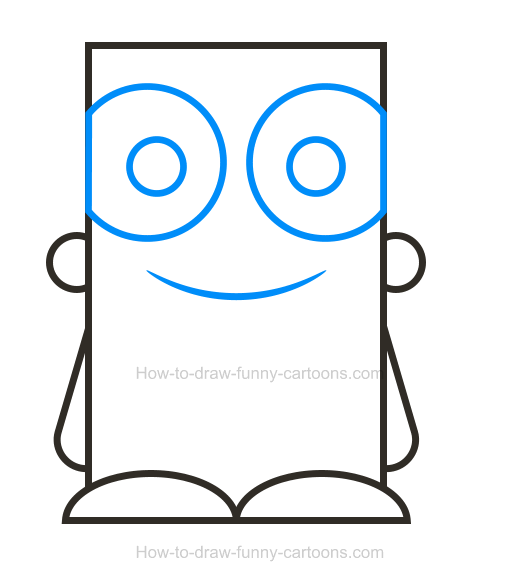 Inside the rectangle, you can draw two large circles to form the eyes. The pupils are made from smaller circles. Complete this simple step by sketching the mouth using a long pointed line. We are almost done! So far, the character looks quite normal. 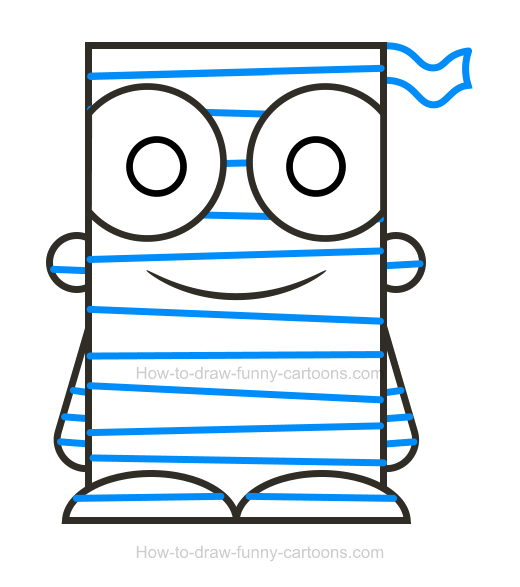 It's time to turn this drawing into a beautiful mummy. Inside the body, the head, the ears, the hands, the arms and the feet, drawn some lines as shown in the illustration below. Make sure lines are not 100% horizontal. Add a small angle on each line to make the drawing more dynamic. You can also draw a small bandage near the top of the head. Yes ... it's time to add colors! In this case, the pupils are red and the body is filled with a color close to yellow, but not as bright. The bandage, the arms and the feet can be darker to create a little bit of depth. Excellent work! 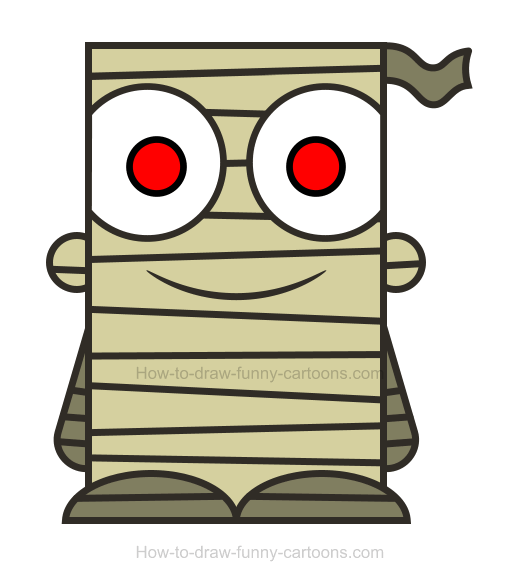 This cartoon mummy looks amazing even if it was created from basic elements and shapes. You can see in the picture below all steps (four of them) needed to illustrate this ancient character.